Photography helps students learn how to make photographs, how to control photographic processes, and how different photographers employ them for their own creative purposes. 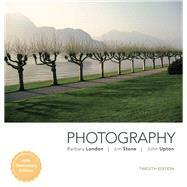 As with each edition of this hallmark text, authors Barbara London, Jim Stone, and John Upton provide comprehensive yet practical coverage of both the traditional practice of photography and the now-dominant contemporary digital techniques. Integrating material on chemical and digital processes throughout, the Twelfth Edition offers fully up-to-date coverage of digital techniques, equipment, and workflow. Barbara London has authored and co-authored many photography books from their first editions to their current ones, including Photography, Photography: The Essential Way, A Short Course in Photography, A Short Course in Digital Photography, The Photograph Collector's Guide, and more. Jim Stone is Professor of Photography at the University of New Mexico. His photographs have been collected by the Museum of Modern Art and The Smithsonian American Art Museum, among many others. Books of his work include Stranger Than Fiction (Light Work, 1993), Historiostomy (Piltdown Press, 2001), and Why My Pictures are Good (Nazraeli Press, 2005). He has also published six higher education titles that are widely used in university courses: A User¹s Guide to the View Camera, Darkroom Dynamics, Photography, Photography: The Essential Way, A Short Course in Photography, and A Short Course in Digital Photography. John Upton, Professor Emeritus, was for many years Chair of Photography at Orange Coast College, one of the largest photography departments in the U.S. He has curated a number of exhibitions, including Color as Form: A History of Color Photography. His work is included in many private and public collections, including the New York Metropolitan Museum of Modern Art.